This recipe for Omelettes was submitted by MiniMidgy on 3/29/2003. Click here to view the recipe. This was my first ever made omelette and my family loved it. Thanks for the recipe, much appreciate it! I added a parmesan-romano mix, with herbs. Loved it! Love this omelettes with the chives inside. Simple and elegant. It was really yummy. Just takes a bit more than 40 seconds. Otherwise it's great. I used spinach, feta cheese and sauteed green onions... so good! Filled mine with shredded Pepper Jack and and canned mushrooms. Was really good! I love your recipe not only because it is easy and fast... also because you gave us pictures as well. Thank you for sharing! Too hot. Browning on an omelette means too hot. Turn the heat down - be patient. This would fail in French cooking class. 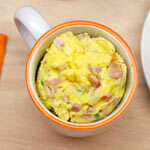 The simplest omelet ever. Came out perfect. This omelet made my morning. I loved it and my kiddies loved it to. The only problem was that it took me 2 minutes to make and not the 40 seconds that is advertised on the recipe title at the top of the page. So that was a bit of false advertising on your behalf but other than that the omelet was amazing! It was very nice. Simple and quick as promised. Thanks! Delicious and super quick to make. You don't need an inverted anything, any spat will do; preferably a rubber one. Hey I'm a beginner, and this looks amazing. But I will use milk instead of water and a spatula instead of the inverted pancake turner... I hope it works!! None of my local stores sell an "inverted pancake turner." What can I use instead? I'm at a loss! This was a great recipe! I used milk instead of water though, because water ruins the consistency of the batter. I also used shredded turkey & chicken, cheese, and a little bit of sauteed onion to put inside. It was very filling! This rocks. I made it for my family and it was yummy. Dear guys this is very good. My name is anna. What is your name. I am 6. I have 2 sisters name is emma and katie. Hey I'm 13 and always late and so this is great. It was so good! Filling of choice: finely shredded Cheddar and chopped green onions. I'm 13 and I'm cooking this for my mum tomorrow morning. Sounds great!!! This recipe is overly simple. I'd recommending using milk instead of water and making sure you season the egg mixture with just a little salt and pepper before cooking. Really good and easy recipe for eggs. Pretty easy to follow too. I know much better recipes than this one. It was great for me just with cheese in the middle... grated Cheddar. I put the lid over the pan after I added the cheese so it would melt and then I flipped the side over. I am a kid. I just made it for my mom. It was dynamite. It was the most tasty recipe ever. Thanks a lot. This sounds great and it seems pretty awesome and tasty according to the comments. I am eleven. Can't wait to try it! Wow! That's great. Even though mine came out deformed, it was delicious. Wow I'm a new comer. I hope this works. It seems to be very good. I love omelets by the way. I am twelve. Good luck to me. Wonderful! Also the cheese is a good idea. I have made omelettes before but never had much luck, they always turned out to be bad scrambled eggs. Great super simple recipe. Simple, but instead of water I put in milk. Also as a bonus a pinch of sugar. Try it. Very good, will make again. PS I just put a half cup of cheese in it. Even without the pancake turner (whatever that is) it turned out delicious. And I've never cooked an omelette before. Goodness gracious, this is like eating a piece of heaven on earth. yummo! Pop in some grated cheese & anything you fancy. Spot on! Just had 2 pan fulls. Just add some black pepper and this is heaven. I'm 14 and I made my omelette and it turned out muy bueno gracias. It was lovely with cheese and chicken filling. It was soooo good. I wanted more. 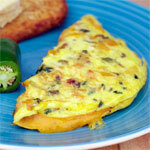 Add a little lemon pepper and it makes this omelet awesome! I like it. Easy. Simple. This worked fine. Thanks for the quick recipe. * a dash of salt or Vegeta seasoning. * add garlic powder, Italian seasoning to taste. 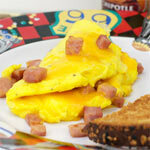 * use plastic spatula notion for tucking the omelet edges under. God!! This was friggin awesome!! Not too bad. My kids liked it. This is a classic and it does take some practice. 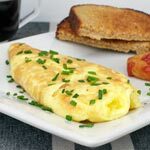 (Though Jacque Pepin made it look disgustingly easy on PBS...) But I've got a news flash for you, folks: the inside of any restaurant omelette is going to be "underdone" since the inside (or the top, as it cooks in the pan) doesn't touch the heat source. Once you've gone so far as to actually scrape the uncooked portion off the top and stuffed it underneath an edge to cook, then allowing it to cook longer will dry the top / inside out a bit but will also burn the bottom / outside. You could put it under broiler, but now you'd've made a frittata. And flipping it will indeed cook it but it won't be a "traditional" omelette then either: it'll be stuffed scrambed eggs! The theory holds that the heat from the folded omelette will finish cooking the inside. My thoughts? Just throw some cheese on the top / inside before filling; it'll melt and you'll never notice the "gross" and "slimy" consistency. And keep practicing! Worked ok for me. Not the best, but considering the time it took, I was pretty satisfied. 'Tis better to flip the entire omelet before adding filling ingredients so the egg cooks through. Under-cooked eggs is the most common source of salmonella poisoning. Thank you. You've helped me to be a better cook! I must say that it worked pretty good. This worked okay for me. It took 3 minutes, not 40 seconds. Not sure about 'inverted pancake turner'. I used a spatula. I think the other commenter just didn't cook it long enough. Eww... it was too slimy.